Over the past year, the team at Applied Influence Group have worked quite closely with a number of clients in the tech sector, amongst other specialist fields. I must admit to having sat in some conversations where I nodded wisely whilst scribbling down lists of words and phrases that I really didn't understand the meaning of. Whether this was "Cognitive Solutions" or "ERPs". At the same time I found myself picking up on signs of confusion when I was talking, only to realise that I might have used a turn of phrase or TLA* from my military background that the other person would have no reason to know. As humans, we use specific language and jargon as a way of differentiating 'our tribe' from other 'tribes'. In the British Army we go for a 'brew' while the Navy and Marines insist that it's a 'wet' while normal people go for a cup of tea or coffee. Anyone with teenage children will know that sometimes you need a translator to understand what your kids are saying and business is no different. While some businesses need to develop their own terms to explain new things and new ways of doing things, this language also allows those 'in the know' to be part of a the tribe. Speaking the same language allows acceptance to the tribe and can be an unconscious status symbol. While this is a natural human tendency it can also cause problems. If you don't speak the 'language' of your client you might lose credibility with them or just not understand how you can best add value to them. On the other hand, if your potential client is worried about feeling stupid because you use phrases they don't fully understand, then they may avoid the meetings you want to have. This doesn't even need to occur at the conscious level - we put off potentially uncomfortable situations without really understanding why we have done it. 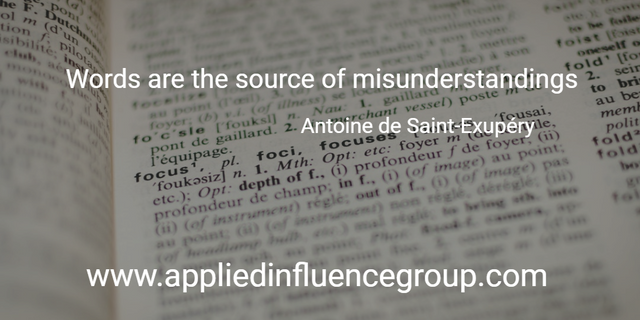 Understand the specialist language of those you want to influence. It's not that difficult to learn the language of a specialist sector even if you may never become 'fluent'. Follow people on social media from the sector that you are trying to work with and you will pick up the phraseology very quickly. Write down phrases or abbreviations that you don't understand and look them up. I've found sites like WhatIs invaluable in finding out what an ERP was or what a Scrum Master did. These and many other terms made no sense to me at all when I left the military 18 months ago. Don't speak a specialist language with those who may not understand it. This may seem like an obvious solution but it can be really difficult not to use the phrases we do all the time with colleagues when we meet someone else. Consciously avoid abbreviations and if you must use specialist language, remove any potential blame the other person may feel. This can be done by explaining that you probably both use specialist language and that if they use a term you don't understand that you will ask them to clarify and that it would be good if they did the same. This can make it acceptable to seek clarification without feeling foolish. * - Three Letter Abbreviation! ** - If you're waiting for your colleague to arrive at the meeting location to catch up and reminisce before you head off for your engagement, then think about getting rid of the jargon.